Reach out to students with the critical skills you need for data science and analytics roles. Fine-tune your employer brand to connect with talent on their terms. And take advantage of specialized candidate pools that can make a big difference in your company. We can help you build a powerful, tailored graduate communications strategy. Create unique communications tailored to graduates and attract the best candidates. Please visit us at booth #1318 and let's get the conversation started. Today’s students are masters at accessing information when, and however, they choose. They bypass manufactured messages and are more interested in the reality of the experience: what it’s truly like to work at a company. And they seek out much of that information from peers and family via social media. Successful graduate recruiting not only acknowledges these trends, but actively engages in those conversations as well. Bring graduate recruitment to life. Linklaters was looking for graduates with serious ambitions to pursue a career in commercial law. 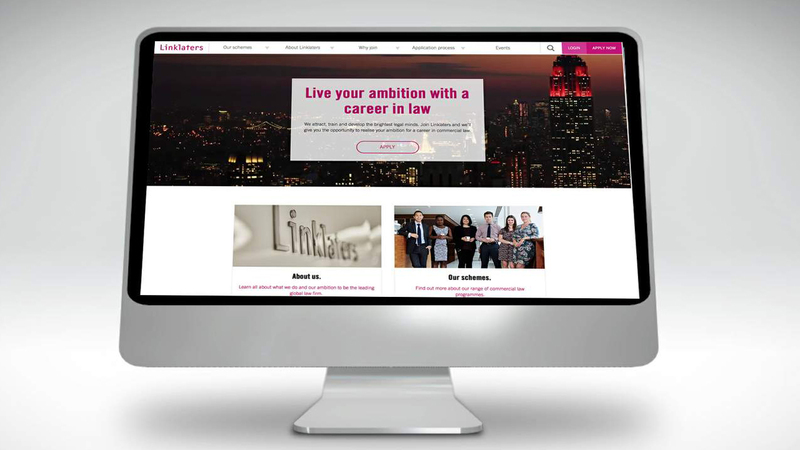 We created an informative, interactive, easily navigable and visually appealing website to inspire graduates to believe that Linklaters is the firm where they can achieve their goals. We have a deep understanding of what drives and motivates this market and can help you approach graduate recruitment with innovative thinking and an aggressive stance in deploying your communication tools – solutions that produce a big buzz and positive word of mouth. Reach out to us to learn how we can help. Check all of your areas of interest below and a TMP representative will contact you. Come to our NACE booth #1318 or visit tmp.com to learn more.